The tipping point of a major ecological crisis is no longer in the future. It's here and now. Is India turning into a desert? Was the week-long stranglehold of dust, heat and high humidity that north India witnessed last week a precursor to what is in store for us in the future? Dust-laden winds from western India and the Thar desert blew across this region, making it difficult to breathe. Even the hill stations of Himachal Pradesh and Uttarakhand were not spared, with a pall of dust hanging over Shimla and Mussorie. This stranglehold saw PM10 levels shoot up to 900 mg per cubic metre, way beyond emergency levels. The double whammy of heat and dust will also have precipitated a surge in the incidence of respiratory disorders. What has this got to do with desertification? Everything. The Indian Institute of Meteorology has issued repeated warnings that the duration of dry spells in the country are set to increase. While the average annual rainfall will remain the same, it will come in short, heavy spurts as was witnessed in Uttarakhand in June 2013. These drier spells and our inability to harness rainwater has already seen more than a quarter of the country become a desert. A study by the Indian Space Research Organisation, backed by satellite images, shows that over 32% of India’s land is affected by degradation, of which desertification is the major component. This is a frightening prospect because, in essence, fertile land is being converted into desert. The figures speak for themselves. India’s total geographical area extends to 329 million hectares (Mha), of which 120 Mha is degraded. Rajasthan accounts for the most desertified land (23 Mha), followed by Gujarat, Maharashtra and Jammu and Kashmir (13 Mha each) and Odisha and Andhra Pradesh (5 Mha each). “Earlier, soil loss was a slow process which took millions of years. Now, we have managed to change that in just a few decades, but the natural time for the soil to regain what it loses is still as long. It is imperative that we need to stop this entire degradation process on a top priority basis,” he said. The report, released by the Minister of Water Resources, Nitin Gadkari, further warned that the crisis will only get worse because, by 2030, the country’s demand for water will be twice the available supply, creating a severe water crisis for millions of people. If that is not dire enough, the report cites data by independent agencies to emphasise that 70% of water being used in India is contaminated, thus placing us in the 120th slot among 122 countries in the water quality index. A UNESCO report, published ahead of World Water Day on March 22, should serve as another wake-up call. India is staring at a deepening water crisis with few steps being taken to ameliorate this bleak situation. It predicts an intensified water crisis across the nation by 2050, with many parts of central India battling a 40% withdrawal of renewable surface water resources. The UNESCO report claims more than half our rivers are heavily polluted. Even more alarming is that our groundwater resources contain metallic contamination and also contamination from improper disposal of human excreta. Elaborating on this, the Central Pollution Control Board (CPCB) has in the last five years doubled the number of ‘polluted’ rivers from 121 to 275. The report found that while Maharashtra had 49 polluted river stretches, including Mithi, Godavari, Bhima, Krishna, Ulhas, Tapi, Kundalika, Panchganga, Mula-Mutha, Pelhar, Penganga and Vaitarna, Assam ranked second at 28, Madhya Pradesh third with 21, Gujarat 20 and West Bengal 17. The situation is no better in the south, where the quantum of water in the main rivers, including the Godavari, the Cauvery and the Krishna, has fallen drastically. The situation has now extended to central India, where fresh surface water resources are also being depleted. The Narmada river, considered one of the few rivers whose flows had been unaffected, has also been hit by a spree of dam construction. Speaking on ground water depletion, S.K. Sarkar, a scientist at The Energy Resources Institute, Delhi, points out that the situation in Punjab, Haryana and Delhi is so severe that it carries the risk of salinity. This will significantly impact the crops of millions of farmers who depend for their survival on groundwater. The CPCB has issued repeated warnings that if the situation is not reversed immediately, the “demand for freshwater for all uses will be unmanageable”. Shimla reached this tipping point last month, when taps went dry for 12 days at the height of its tourist season. It was not just the residents who had to brace themselves for a waterless summer. Many forest fires around the city could not be put out because the municipal corporation had no water. Finally, the state government had to put in a request for Indian Air Force choppers, which lifted water from the Gobind Sagar dam in Punjab to douse the flames. Another factor feeding the spectre of increasing aridity is rapid deforestation. For example, the forests of the Aravali hills protected the National Capital Region, including Delhi, against the dust from Rajasthan. But our political class and bureaucrats do not seem to realise the gravity of the situation. Despite the Aravali having been designated a Natural Conservation Zone, environmentalists are crying wolf over the latest attempt to exclude a large swathe of forest land located east of the Surajkund-Badhkal road. Chetan Agarwal, an environmental analyst, recently wrote to the National Capital Region Planning Board about how a vast track of 5,000 ha of Aravali land was not shown to be forest by the authorities, obviously keeping in mind the surging demand for real estate development. “We are facing an ecological crisis. Unless we come up with strategy to preserve our ecological resources which help provide water and livelihood security, we will see a worsening of the situation,” said Himanshu Thakkar, an environmental activist who heads the South Asia Network on Dams, Rivers and People. 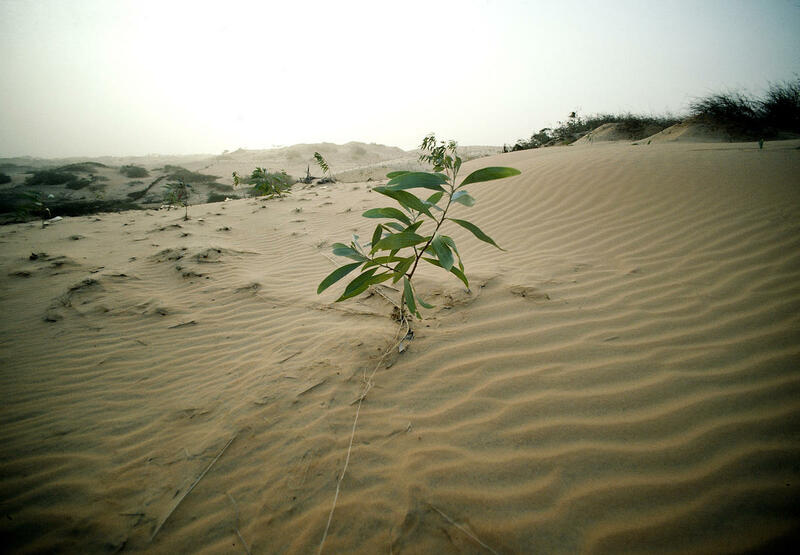 India does not have a specific legislative or policy framework to combat desertification. However, the concern for arresting and reversing land degradation and desertification is reflected in many policies and soil conservation programs, but few of which are realised. An eminent water conservationist and a Ramon Magsaysay Award recipient, Rajender Singh has also warned against the impending crisis. “We are facing severe drought conditions across several states that include Madhya Pradesh, Maharashtra, Karnataka, Telangana, Andhra Pradesh and Tamil Nadu. Neither the central nor state governments have come up with any long-term plan to tackle this situation,” he said. He finds it ironic that, over the centuries, India had developed an expertise to manage drought and floods — both of which are two sides of the same coin. “Traditional, community-driven, time-tested models on how to handle drought as also our water resources which helped ensure that our rivers, lakes, wetlands and other water bodies remained intact over the centuries but these methods are being totally ignored today,” Singh said. Scientists believe the government should have been at the forefront of mobilising vulnerable communities to help them harvest rainwater and to regenerate ecosystems, thereby enhancing nature-based livelihoods. Climate change adaptation and mitigation should lead this effort by the Ministry of Environment. However, its only focus seems to be to facilitate the ease of doing business to the detriment of all else. Rashme Sehgal is an author and a freelance journalist based in Delhi.